Memo. No.18/PA/8598 Dated. 30 /11/2018 has issued by Chief Executive officer District Education Authority Sheikhupura regarding Promotion Letter For Employee Elementary School Teachers & Primary School Teachers. 1. The District Education Officer (SE), Sheikhupura. 2. The District Education Officer (M-EE), Sheikhupura. 3. The District Education Officer (W-EE), Sheikhupura. 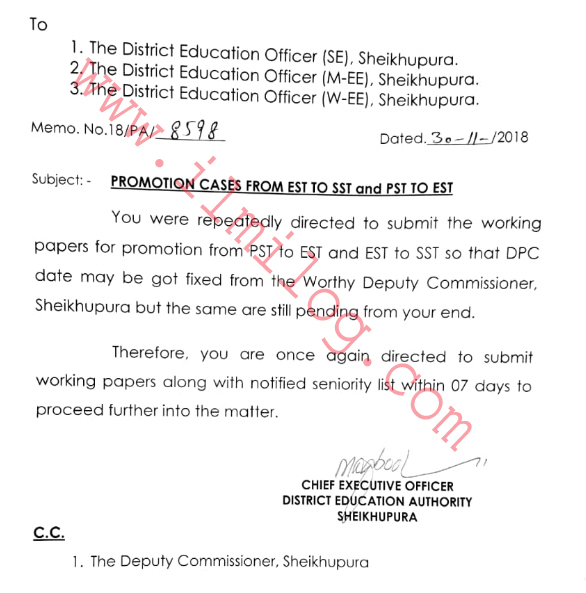 You were repeatedly directed to submit the working papers for promotion from PST to EST and EST to SST so that DPC date may be got fixed from the Worthy Deputy Commissioner, Sheikhupura but the same are still pending from your end. Therefore, you are once again directed to submit working papers along with notified seniority list within 07 days to proceed further into the matter.